SAN MATEO, CA--(Marketwired - Dec 5, 2016) - Nlyte Software, the world's leading software company developing solutions for automating the management of data center infrastructure, today announced new enhancements to Nlyte 8. 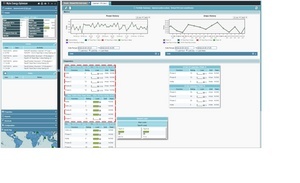 The new Nlyte 8.1 version is specifically engineered to support mission-critical facilities with improved energy/environmental monitoring capabilities and tighter integration with critical data center workflows. Busmains & Tapoffs -- Provides real-time power chain status and architectural view from the devices feeding the busmain -- down to each connected tapoff -- as well as cabinets, strips and assets. Virtual PDU -- Removes the difficult and costly process of tracking power through expensive physical power strips. NEO-Nlyte Alarm Workflow - Integrates alarms originating and tracked in NEO into a full workflow process -- including full ITSM integration. "With Nlyte 8.1, our customers now have improved capabilities to more accurately and securely track their power chain and workflow in the data center," said Robert Neave, CTO and Co-Founder of Nlyte Software. "These new capabilities will enable organizations to more easily increase the efficiency of their data center operations." Nlyte 8.1 is currently available. For more information, please contact: info@nlyte.com or call 650-642-2700. Nlyte is the leading software company that automates the management of services provided by the data center (DCSM). Many of the world's largest and most sophisticated data centers use Nlyte to become more agile, reduce costs and operate more efficiently. Founded in 2004, Nlyte provides a comprehensive and proven DCSM solution with a modern, web-services architecture. With Nlyte, customers can easily manage all their existing data center processes, resources, policies, assets and interrelationships. For more information, visit www.nlyte.com or follow @nlyte on Twitter. Nlyte 8.1 enhancements include Virtual PDU which removes the difficult and costly process of tracking power through expensive physical power strips.